Applying the same kind of horn-loaded magic that makes Klipsch a worldwide leader in the professional cinema industry the CS-700 brings astonishingly big movie theater sound to the comforts of home. This 2.1 home theater system—featuring just two compact satellites a wireless subwoofer and an A/V center—creates enveloping virtual surround sound performances that put you smack-dab in the middle of the action. 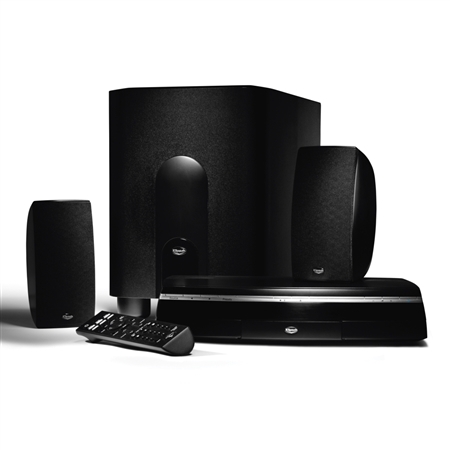 It does so by applying Dolby® Virtual Speaker technology which simulates the effect of a five-speaker surround system. Each compact satellite employs dual magnetically shielded 3-inch woofers and a 0.75-inch magnetically shielded horn-loaded tweeter. The subwoofer utilizes an 8-inch down-firing woofer and 200 watts of amplifier power to generate hard-hitting bass response. And due to its compact size and wireless capability it can easily be hidden away while still delivering dramatic low-end effects. The CS-700 home theater’s A/V center has an up-converting DVD player that is capable of delivering a 1080i resolution via its HDMI output so the signal matches the amazing resolution capability of an HD television. It also features an AM/FM tuner and three auxiliary inputs allowing users to connect other audio devices to the unit. A universal IR remote control directs all system functions as well as those of the TV and other entertainment devices.